Join us on the evening of November 8, at that regular magic place and magic time, for our next meeting featuring magic performances from your fellow members and more. At our September meeting, John Lovick taught us his handling of a tipless bill switch, known in his book "Switch" as the "100th Dollar Bill Switch." At the next meeting, we'll informally get together to practice techniques and share feedback on this move. So arrive early and bring a couple of different denomination bills. 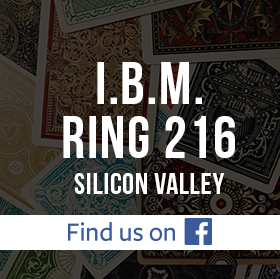 Please join IBM Ring 216’s Tribute and Celebration of the Magical Life of Bill Benson, a longtime member and past officer of the club. We'll have a Broken Wand ceremony, and members and family will be invited to honor Bill's life in magic. Refreshments will be provided. After a break, we'll continue the meeting with the election of Ring 216 officers. Please see this page for details. The rest of our meeting will be devoted to open performances. Magicians can perform any routine they want, but priority will given to magicians performing in honor of Bill Benson. Please bring your works in progress, or even your favorite gem looking for that extra bit of polish, to share with the group. Come ready to help your fellow magi improve his or her craft with your constructive feedback. To accommodate as many performers as possible please plan to perform a piece no longer than 5 or 6 minutes in length in order to allow time for brief feedback.